The Air Force's Black Eagles aerobatic team plans to take part in an air show next month in China's Guangdong Province, but the U.S. is trying to block the move citing the risk of exposing classified technology. The Black Eagles use T-50 trainer jets developed by Korea Aerospace Industries with technological support from Lockheed Martin. Korea needs U.S. approval in order to export the T-50 trainers and to fly the aircraft into “hostile” territories. A government source on Wednesday said the Black Eagles "have been preparing for some time to take part in the Zuhai Air Show next month, but the U.S. recently expressed opposition to the plan." 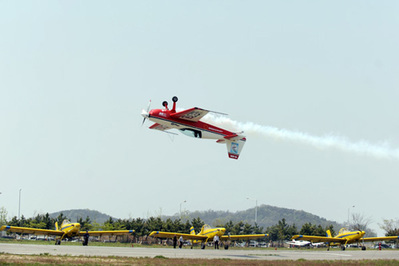 The team is scheduled to perform in order to demonstrate strengthened military ties between Seoul and Beijing. It was decided in July talks between Vice Defense Minister Baek Seung-joo and the deputy chief of the People's Liberation Army, Wang Guanzhong. The U.S. veto has drawn some flak here. An Air Force officer said, "We believe the issue will be resolved through negotiations between the U.S. and Korea and the Black Eagles are practicing to enter the air show." The biennial Zuhai Air Show is China's leading aviation showcase and features state-of-the-art drones, attack helicopters and other aircraft. Arms manufacturers from around the world except for the U.S. and Europe take part in the event.